Rohit Shetty’s Upcoming film Simmba Actors Ranveer Singh and Sara Ali Khan recently Spotted doing promotion of their film on the sets of Zee TV’s SaReGaMaPa 2018 Singing reality show. Now, Actors reached to the sets of Singing reality show Indian Idol 10 and Dance reality show Dance Plus 4. Yes, Reality Show Platform is the Biggest medium to promote any upcoming Bollywood films. 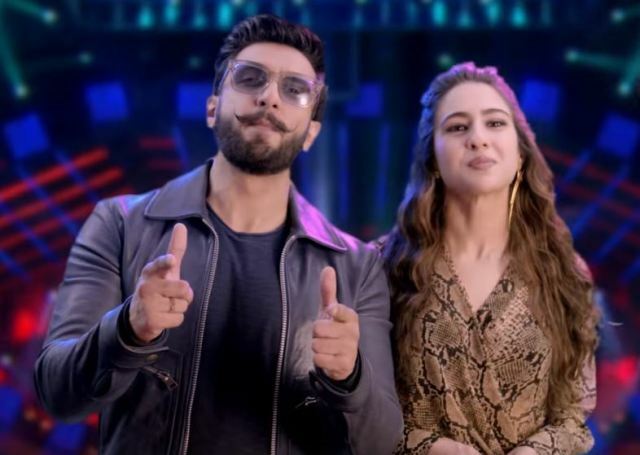 Sony TV’s Indian Idol Season 10 reality show reached very close to the Grand Finale and Now, Semi Finale Episode will be more thrilling with Simmba Actors Ranveer Singh and Sara Ali Khan. On the Upcoming Episode of Weekend you will have Fun, Masti and lots of drama with Simmba Actors and Top 6 Semi Finalists. Also, Remo D’Souza’s Star Plus Show Dance Plus 4 is hunting the Top 8 Contestants in Team Shakti, Dharmesh and Punit Pathak. The Dance+4 having the 6 contestants already been selected for the Top 8. Actors Ranveer Singh and Sara Ali Khan also becomes guest this weekend on Star Plus aired Dance Plus 4 Show. Don’t miss to have Dance Masti and Entertainment filled Episode of Dance Plus 4 this weekend on Star Plus. Rohit Shetty’s Action Thriller Simmba Starring Ranveer and Sara Scheduled to release on 28th December 2018 and to make the film Hit, Actors are busy doing promotion of the film on various Shows. The Simmba Movie Promotion Special Episodes of Indian Idol 10 and Dance Plus 4 to be aired this weekend on 15th and 16th December 2018. You will have the Roaring Weekend with Simmba.